We love a day trip to London, the boys enjoy hopping on the tube and trains and there’s an abundance of places to visit. Even though we live so close, there is still so much of London we’ve yet to explore properly. Back in September, we spent the day in Greenwich for my mother-in-laws birthday. 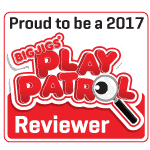 Other than heading to the O2 a couple of times a year, it’s not really somewhere we’ve spent much time at and we were pleasantly surprised by how much there is to see and do. 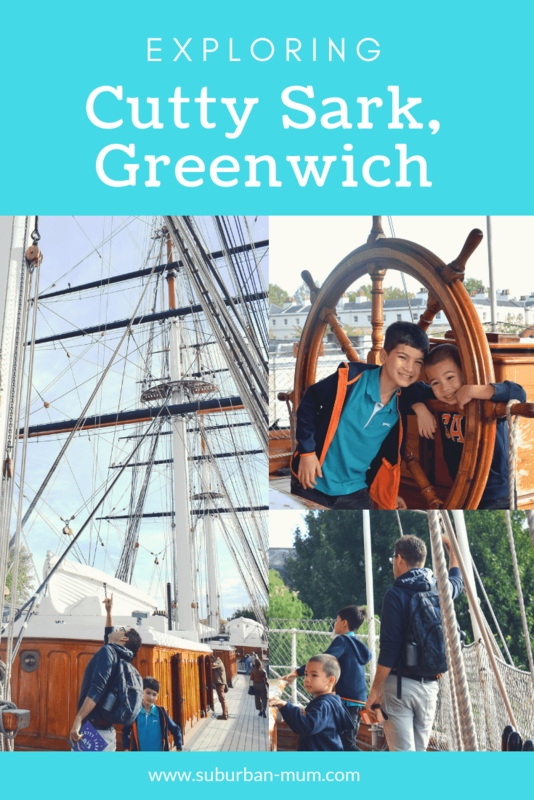 We visited the planetarium and the National Maritime Museum but we ran out of time to hop on board Cutty Sark so we were rather pleased to head back there last weekend to fully explore all the ship has to offer. If you have transport loving children like my boys then they will love the journey just as much as the ship itself. 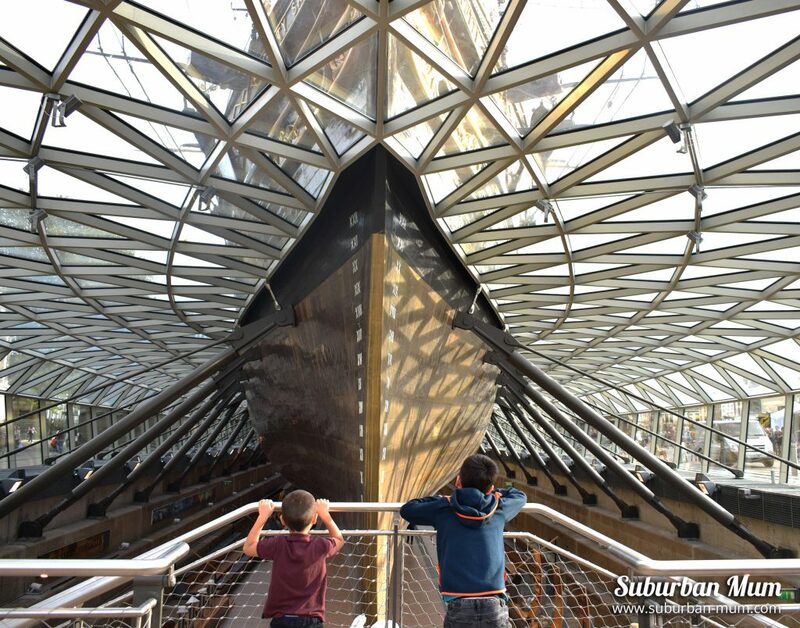 The Cutty Sark is located in Greenwich but you can get to it by train, DLR or by river bus. The boys were super excited to be heading on the DLR again. 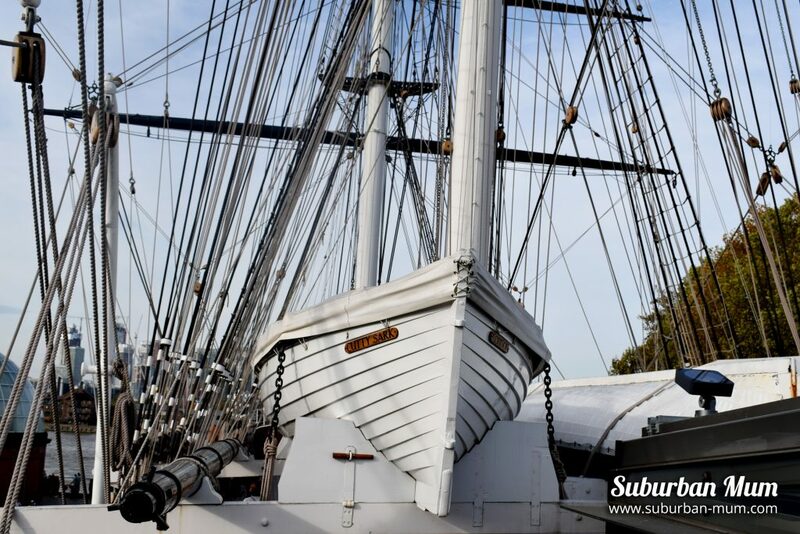 The Cutty Sark is a British clipper ship from the 1800s that has certainly led an interesting life. She started off in the tea trade before transporting wool from Australia and remained a cargo ship until 1922 when she was used as a training ship. In 1954 she retired and was transferred to Greenwich which is now her permanent home. 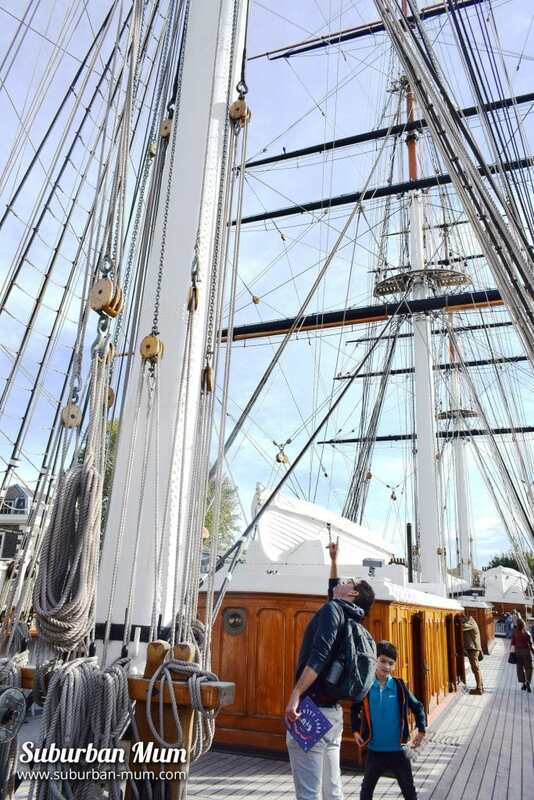 Cutty Sark has been lifted up by over three metres to allow visitors to explore all sections of this impressive ship. 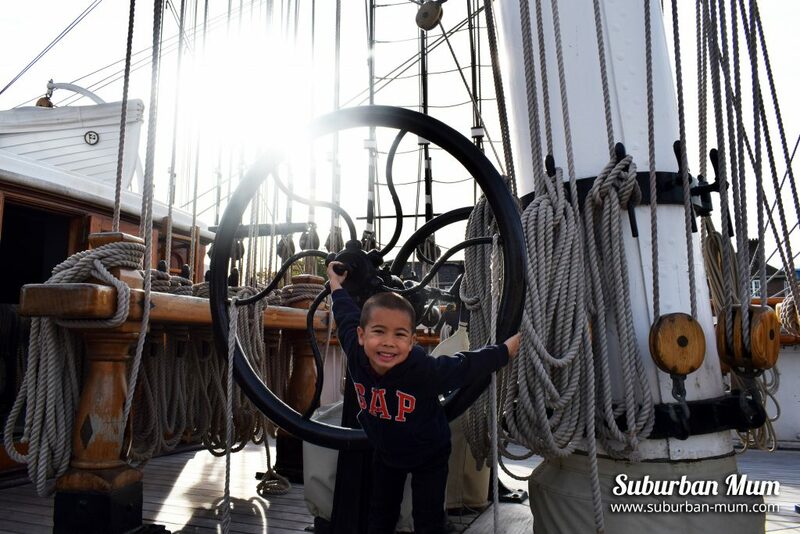 After grabbing our tickets and Explorer trail booklets from the ticket office, we stepped onboard. The ship is split into four levels and we started off in the lower hold part of the ship. 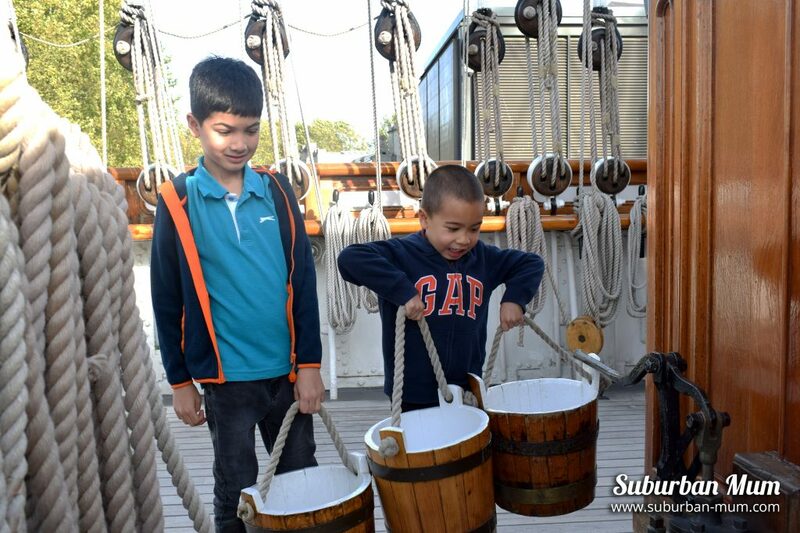 Here, the boys learnt about Cutty Sark and the type of cargo she transported. We loved seeing representations of the beautiful tea chests that she transported. Next, we headed onto ‘Tween Deck which was used to store cargo. There were plenty of interactive activities on this level that showed what life on board was really like. 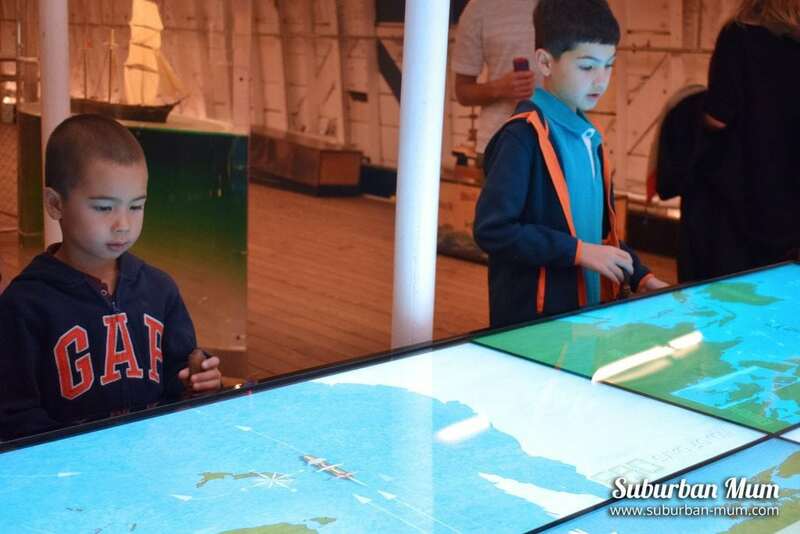 The boys particularly enjoyed attempting to navigate Cutty Sark from London to Australia. 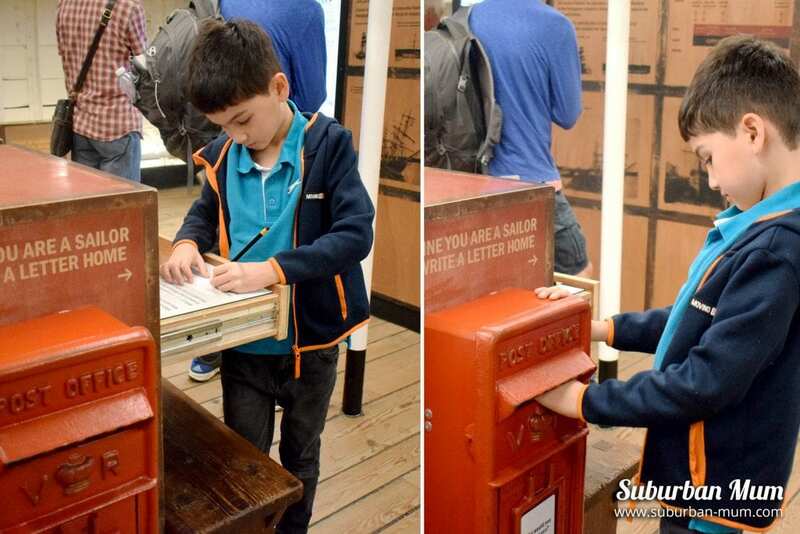 E also imagined what it would have been like to be a sailor on board and wrote and posted a letter back home. 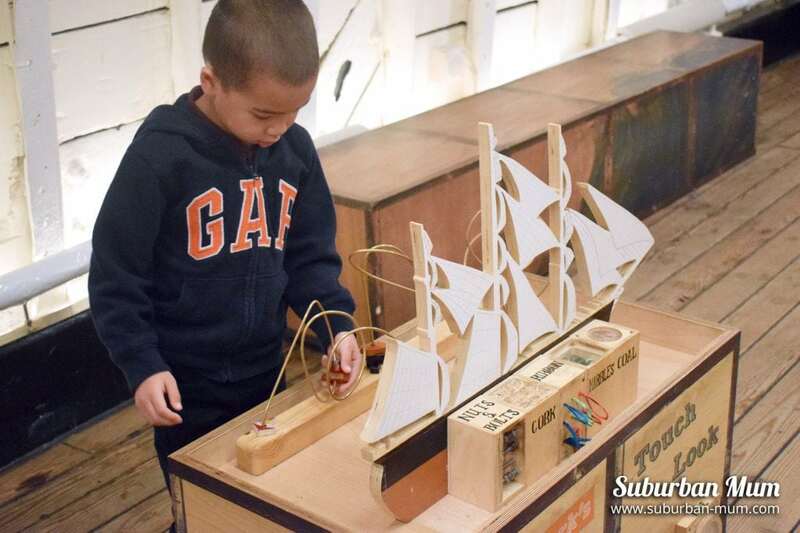 For younger children, there are buttons to press, boxes that you can pop your hands into as well as a wooden play ship that visually shows you the type of cargo other than tea and wool that Cutty Sark had on board. There’s also some cool moving benches that you can sit on that simulate the movement of a rocking ship. We then moved onto the main deck which had impressive views across London. We imagined how the crew lived whilst at sea and had a wander around and saw where the crew slept (in tiny bunk beds), as well as the captain’s quarters. The boys were highly amused to see the toilets too! We also checked out the kitchen where their food was made before heading to the ship’s wheel which was restored back in 1957. Lastly, we headed to the dock. 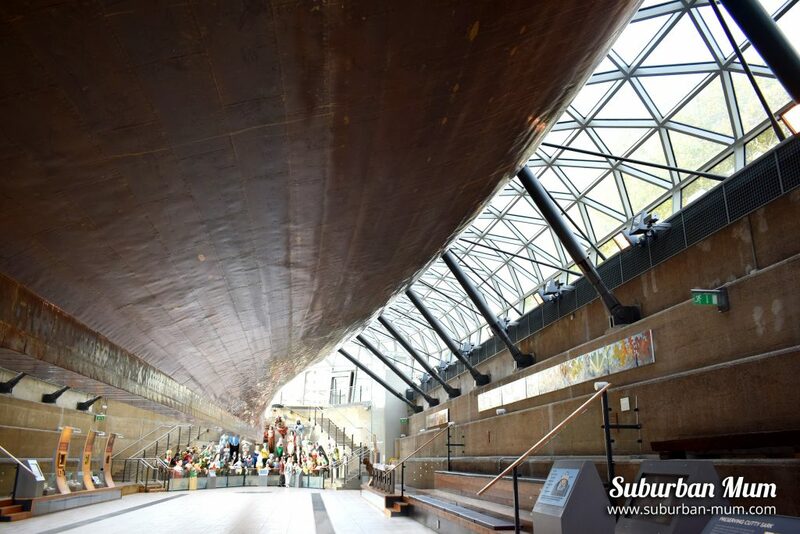 This is where you can see the hull of the ship in all its glory and touch the original copper coating. We stopped by the cafe for a much-needed cup of tea and cake. 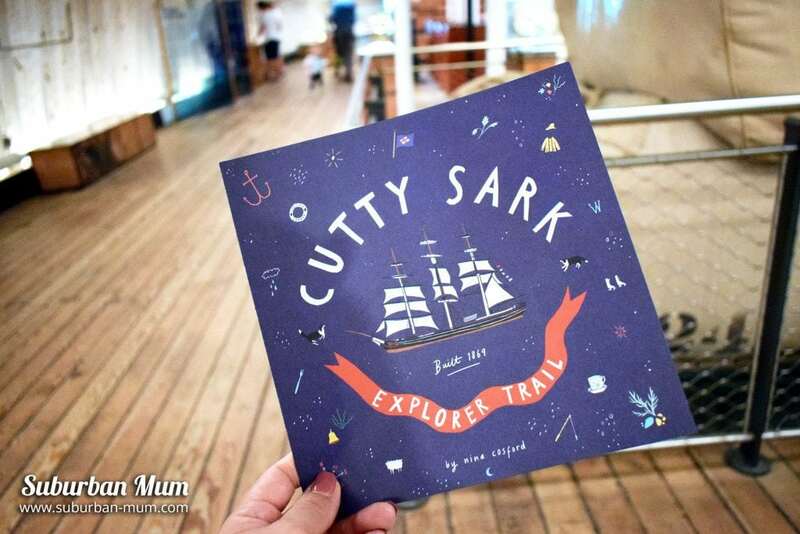 We really enjoyed our afternoon exploring Cutty Sark, there is plenty of interesting activities for children – and adults of all ages. We happily spent a couple of hours there. 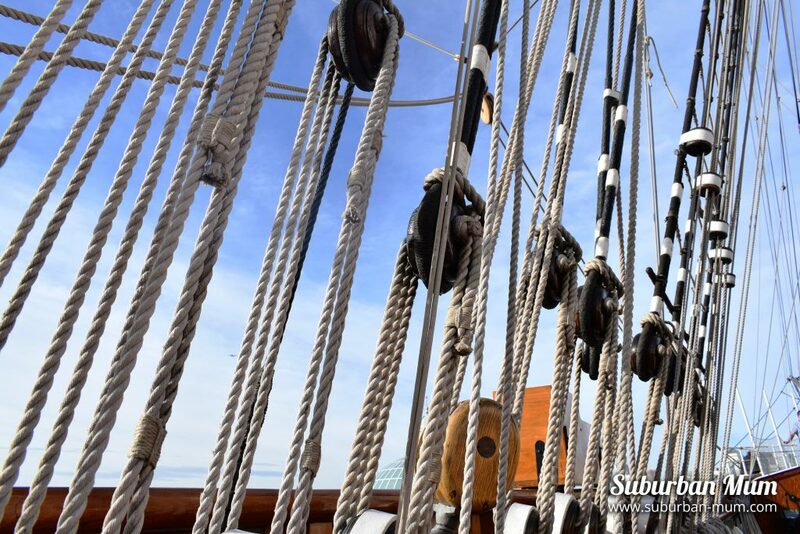 Cutty Sark runs a number of events throughout the year. This half term there is a storytelling festival with different stories told each day as well as a craft activity. 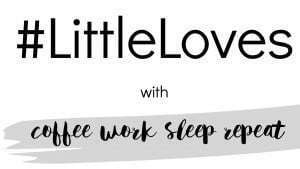 For younger children, they run Toddler Time every Wednesdays in term-time where you can bring your little ones along for songs, stories and playtime. Tickets can be bought on the day or in advance online at the Cutty Sark website and are £12.50 for adults and £6.30 for children. 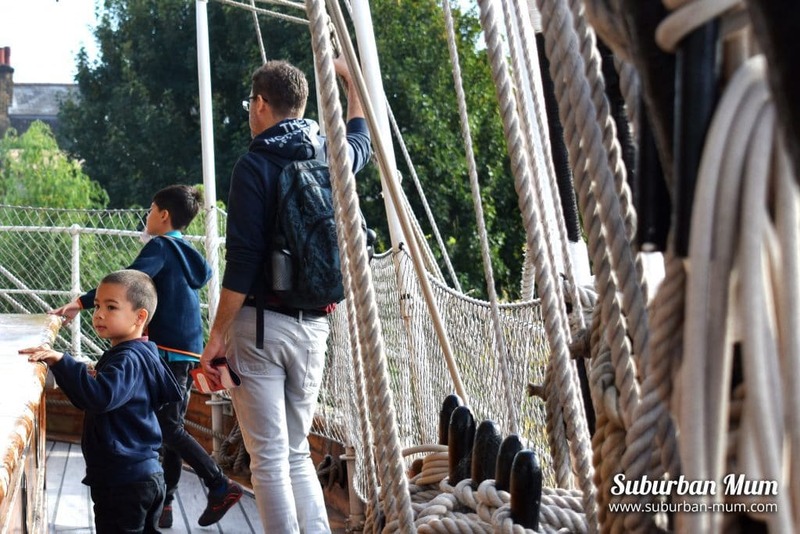 I think Cutty Sark is a great day out for children. 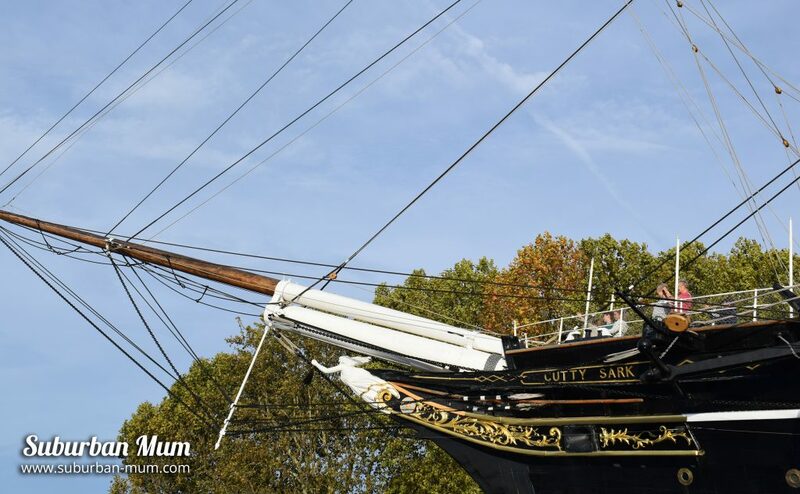 It’s easy to get to via train, DLR or boat and you can easily incorporate your visit with other nearby attractions such as The Maritime Museum and Royal Observatory which includes the Planetarium. 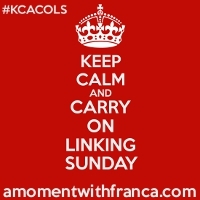 *This is a paid collaboration with Cutty Sark. We were also gifted entrance to the attraction. All opinions, words and images are my own. Greenwich is amazing isn’t it? 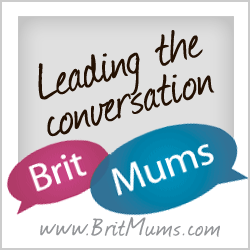 There’s so much to do there – brilliant for a day out with kids. 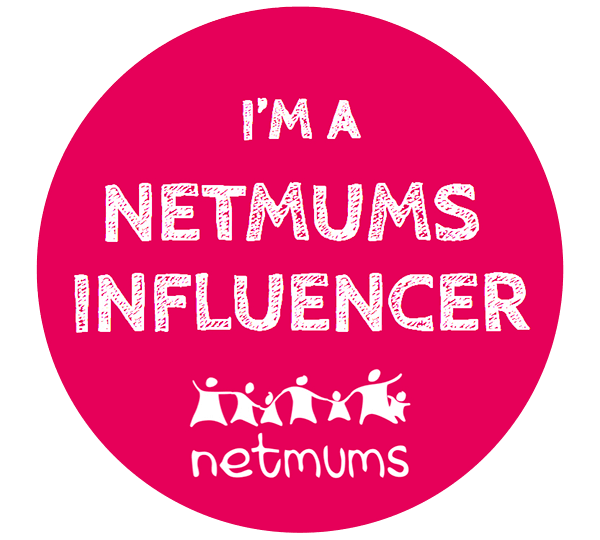 I haven’t managed to persuade my teens to venture on to the Cutty Sark yet but you clearly had a fab day! Yes Greenwich was lovely just to mooch around in! Ah I used to live near Greenwich and I visited here as a child but haven’t been back since! 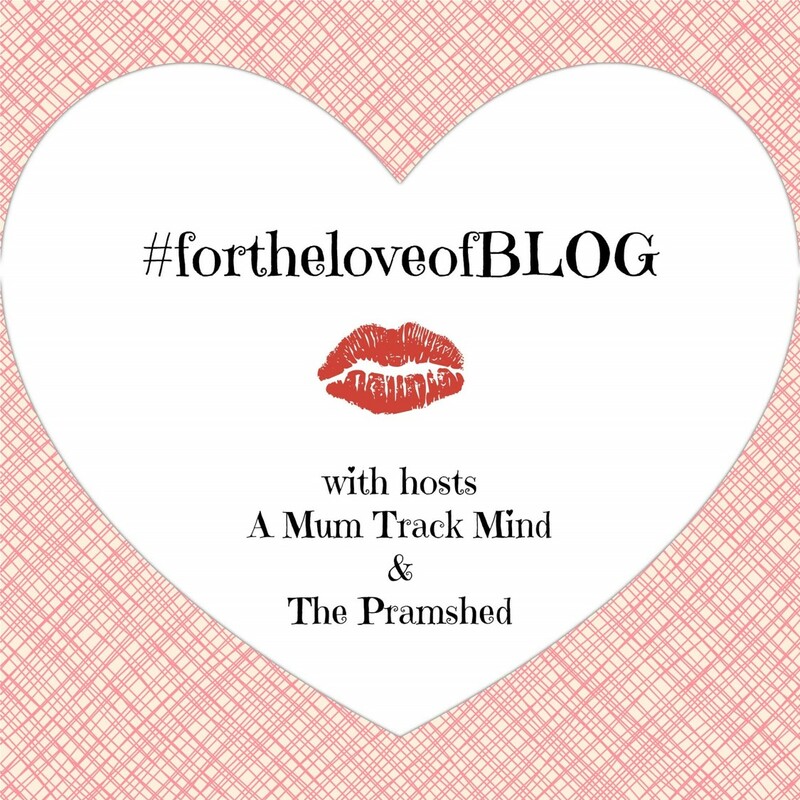 It looks like a really fun day out with kids – will have to go back with my children! 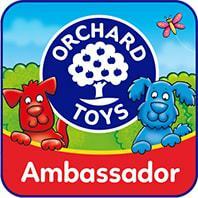 I think its worth a visit with the kiddies if you can – lots to do! 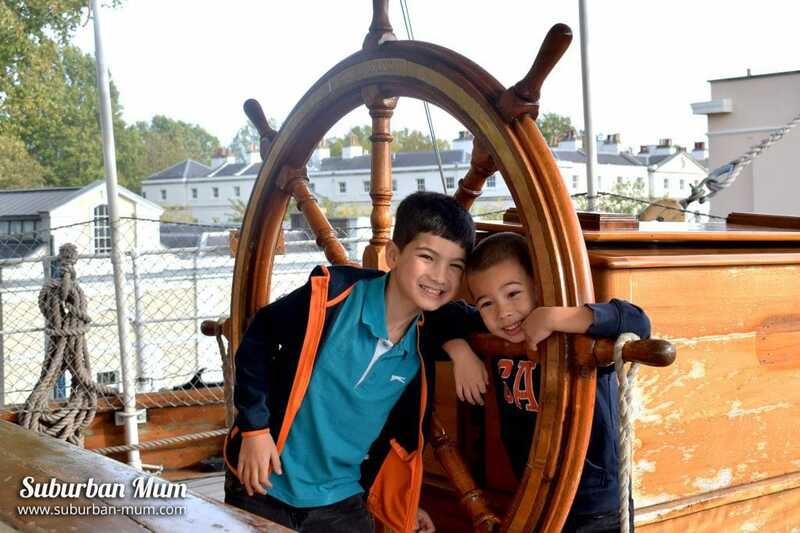 We had lots of fun there – the boys loved the trail and attempting to sail the boat from London to Australia! 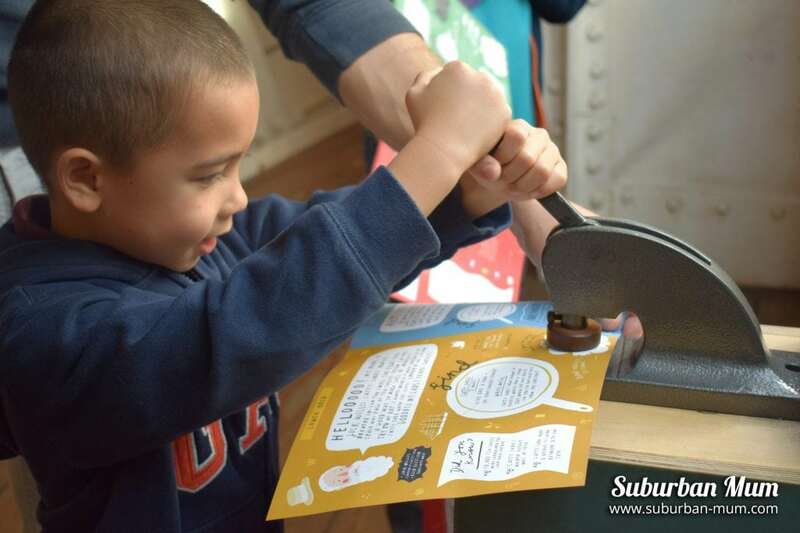 It was really interactive for kids and lots of fun! 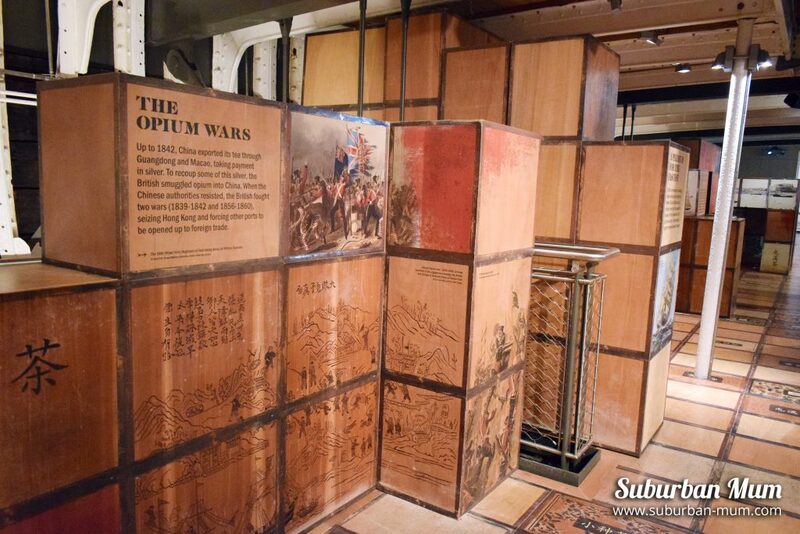 There’s always lots to do in London – plan a trip if you can it’d be worth it! Thank you! 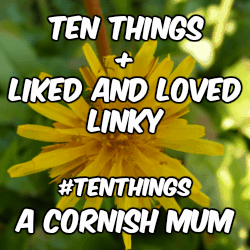 We had a fab time there and the boys want to go back! Oh, they sound like they would be good places to visit! Isn’t it funny how you never manage to make it to places that are close by to you? Yes Greenwich is a lovely place with lots to do! We were very lucky with the weather. Poor Franca had the heavens open when she went!